The Municipal Development Plan (MDP), The Way We Grow, is the City’s strategic growth and development plan. Through its MDP, the City of Edmonton will shape the city’s urban form and direct the development and implementation of more detailed plans. The plan is closely integrated with the Transportation Master Plan (TMP) to achieve more coordinated decision making. The plan also includes a regional component which addresses the coordination of future land use, growth patterns and transportation systems with Edmonton’s neighbouring municipalities. The Municipal Development Plan is the culmination of ongoing consultation with Edmontonians dating back to 2006. Through a series of public and stakeholder consultation sessions on the plan, previously called Focus Edmonton, the City was able to take a wide range of views into consideration in the Plan’s development. The proposed Municipal Development Plan was initially presented to City Council at a Public Hearing in November 2008, along with the Transportation Master Plan (TMP). The TMP was approved by Council in September 2009. The MDP received considerable public input and numerous City Council amendments during the Public Hearing. On February 22, 2010 the Public Hearing concluded and the proposed MDP was given second reading by City Council. The Plan was then reviewed and approved (May 10, 2010) by the Capital Region Board. On May 26, 2010, City Council gave the plan third reading and final approval. See Council and Committee Meetings for details. This online tool showcases performance data for some of the municipal services the City provides. 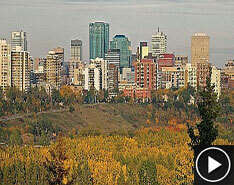 Edmonton's Municipal Development Plan, is the City’s strategic growth and development plan. It directs and shapes Edmonton’s urban form over a 10-year period. Planning for future transportation needs.